Summer is here and the time is ripe for cocktails, champagne, tea and croquet. The first annual Garden Party and Croquet Classic hosted by Cocktails & Canapes and Max Cunningham at the VanDusen Botanical Gardens is set for Saturday, August 23rd, in support of the Backpack Buddies. Designed for some frivolous fun and frolic, The Garden Party will kick off with a twist on the traditional High Tea at Noon. Featuring the culinary talents of Chef Brett Turner, owner and Executive Chef of Cocktails & Canapes, prepare to be welcomed with all the traditional tea time favourites served alongside specially prepared hors d’oeuvres and champagne. 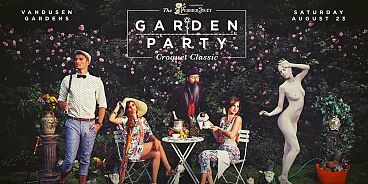 For more information or to sign up your team for the Croquet Classic, visit The Garden Party.